Programming language for "special forces" of developers. 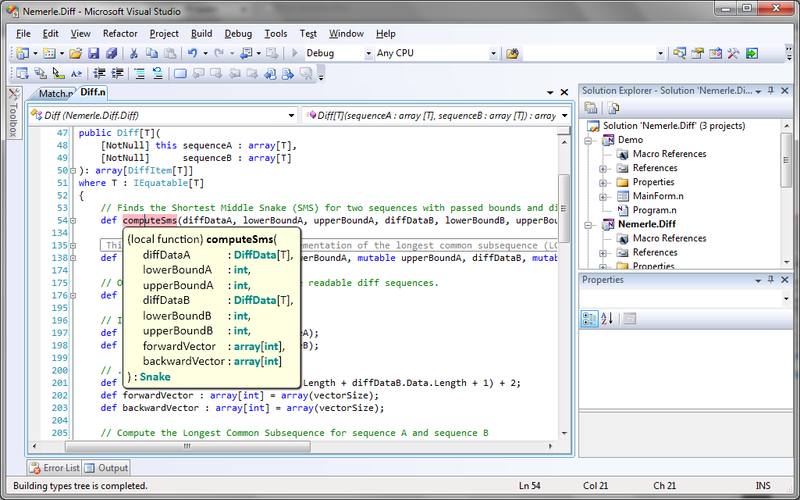 Nemerle is a general-purpose, multi-paradigm programming language for the .Net platform. It is as easy to learn and use as C# or VB.NET but Nemerle is by far more powerful. One may start using it as an advanced C# and then, as learning goes on, employ a range of cool features enabling metaprogramming and functional programming. The metaprogramming is based on macros bearing some similarity to Lisp. Supported paradigms: Object-Oriented Programming (OOP), Functional Programming (FP), Metaprogramming (MP), Component-Oriented Programming (COP), DSL-Oriented Programming (DOP) or Language Oriented Programming (LOP). Type system: static typing, strong typing, inferred, nominal. Influenced by: C# (OOP & Imperative support), ML (FP support), Lisp (macros support). Supported Platforms: CLI (.Net & Mono). def dict = Dictionary(); // Dude, where are my type params? dict.Add("key", 42);     // The type params infered from usage! Full support for functional programming inherited from the ML family of languages (ML, OCaml, F#, Haskell) and can solve problems not only quick and easy but also very beautiful. Macros allow you to raise the level of the program to unprecedented heights without sacrificing the richness of the language’s syntax as in Lisp. You can develop macros which simplify a solution of your every day tasks. One of the Nemerle paradigms is the Language-Oriented Programming (LOP). It’s a new approach of software development. The LOP allows you to create your own domain specific language (DSL) to solve the problem by describing it in completely declarative manner. Macros allow you to implement and maintain DSL. Macros allow getting automatic support for IDE much faster and easier. Using macros you get high speed of the generated code, etc. IntelliSense (IDE) support (real-time error reporting, navigation). Nemerle 2.0 macros system will be based on Nemerle.Peg. Allows using of XML quasi-quotes inside Nemerle-code (XML-literals allow active areas and control structures). This feature is analogous to that in languages like Scala and VB.NET but is available as a separate module (macro) or source code. XML-literals support inline operators: foreach, when and unless. Gives similar possibility of F# language (Computation Expressions). Such beautiful syntactic sugar (on monads) greatly simplifies the creation of features like “comp async” (parallelization of code execution ) or “comp enumerable” (generating a sequence inside a expression). Library of Nemerle’s macros on Rails (NoR) is analog of Ruby on Rails but in a statically typed language. The world of statically typed languages has the same framework (Scala’s Lift). But the implementation for Nemerle is based on macros and recognized standards such as LINQ. Splice-strings. Ruby style "active" strings that were implemented using macros. LINQ support - this feature is also implemented using macros. Macro that allows you to walk through a complex data structures. It’s similar to using a visitor pattern but without the manual work. Macros which automate the implementation of OOP design patterns: Abstract factory pattern, Aggregation (Composite), Proxy, Singleton. DependencyProperty – easily helps to implement WPF’s properties. AOP – the support of aspect-oriented programming.